I have somewhat eclectic taste in books - I usually try to have a few at a time that I’m working on, and one of those is usually some book that is difficult to read (e.g. philosophy). 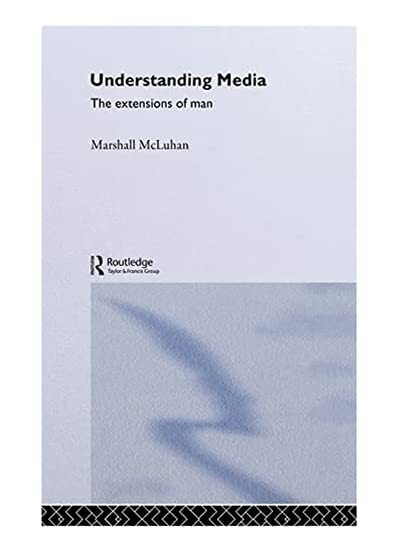 Right now I’m reading Marshall McLuhan’s “Understanding Media”. McLuhan was a communications theorist who coined the phrase “the medium is the message”. I still don’t fully understand the implications of this phrase, but it seems to have something to do with the effect of the intrinsic properties of a medium on the content that is being transmitted through it. For example, a film by its very nature as a technologically-advanced medium conveys technological advancement, as well as other related values, along with the content of a particular film. Apple pie, which McLuhan would consider a medium, can be used to convey certain messages (home, comfort) and not others (illiteracy, nuclear war), or perhaps those can be conveyed but with more difficulty. This partial comprehension happens to me a lot. Why, or perhaps how, do I read books like this and is it worthwhile? One theory is that reading a book can be like standing in a river. You pass your eyes over the words (or in the same way you feel the current rushing past your legs), and you pick up and remember whatever fragments you pick up and remember. This is what I’m experiencing now. The advantage for the reader is that it makes a complex reading experience much more relaxing, and allows an inspirational sort of reading rather than a careful reading for content. This is especially helpful if you might disagree with the main content of the book since it allows you to take the pieces that interest you more easily. An author, similarly, can riff on a theme without needing to have a plan in mind. The disadvantage is that, as a reader, you wonder if you’ve missed some point that will be key to your understanding later, though I haven’t found that this has happened to me yet. Arguably, however, it is actually important to develop a full understanding of the ideas within these books, but I’m just not doing it and am therefore failing in my reading. When I was at Columbia, I tried my best to read in this “full understanding” way - spending days on a passage from Aquinas, for example. I didn’t do this for fun, just to be clear; I did it because I had to in order to write what I felt were worthwhile essays for class! While it is incredibly slow, the advantage of reading this way is that it is very satisfying, and it feels respectful of an author’s ideas. The major disadvantage - an unacceptable one, in my opinion - is that it also gives way too much credence to dumb ideas as well as smart ones. It’s easy to create meaning where there actually isn’t any. I think quick comprehensibility is a good heuristic for sensibility. Sometimes I wonder if perhaps I should just stop reading books that I find inaccessible. There are many, many classics of world literature and thought that are easy to understand as well as being thoughtful - take the Federalist Papers, or The Book of Tea, or In the Shadow of Man, all of which were relatively straightforward, if not easy, to read and all of which I learned a huge amount from. I could probably save a lot of time, and therefore learn more, by concentrating on these. [caption id="" align="alignleft" width="400" caption="Moving information"][/caption] Here’s one of the things Marshall McLuhan, writing in 1964, had to say about productivity in the modern age. "The main 'work to be done' is actually the movement of information. The mere interrelating of people by selected information is now the principal source of wealth in the electric age." A pretty prescient comment, right? This is in 1964, before a home PC was even seriously contemplated.